Peer-to-peer transaction-based model for indirect, consequential damages to offset, reimburse, remedy external impact of economic activity theoretically is a better alternative to Pigouvian taxes, cap-and-trade, or even offset policy, or litigation. The model assumes that from the economic point of view, the cause and the source of negative external impact that can be accounted as indirect, consequential damages is a value exchange activity most commonly known as transaction, and the parties to the deal are liable. Theoretical discourse on the issue would be speculative if not confirmed by the experiment. What the design of such experiment might look like? What deals would be most suitable for the experiment? As we have tried to argue earlier, i) the sematic context of the origination of the values in the primary deal should be the same with the context they are traded in; ii) the definitions of the exchanged values of the counterparties should exactly coincide. Under these criteria, cryptocurrencies are most suitable for the experiment i) as their provenance in the p2p blockchain ecosystem already has been verified within the p2p blockchain ecosystem, within the sematic context, and the values do not need additional verification and do not need warranties or security against double-spending; ii) and the definition of the values offered may be very strict and cover not only the lines of code but such features as the range of blocks they have been mined or the number of hands, transactions they have been through, etc. The suitable pair to trade under these criteria would be Bitcoin vs Ether. For the sake of the representativeness of the experiment, we might want to include the other pair of values that are generally perceived as “real world values” as opposed to cryptocurrencies. Off the top of the head, what could be more representative than gold and oil? So, the second pair could be Oil vs Gold. The problem with this pair of values is that they do not originate in the context they would be traded, and we would have to make a provisional concession and accept out-of-our-universe documents that prove to the existence of the values in the ownership of traders and provide warranty or security against double-spending. The other problem, again, is congruence of definitions. The pairs of definitions for oil and gold of the counteragents in the experiment should be identic, whether they represent ownership rights for specific amount of oil and gold stored in specific location, or contract rights, or net smelter return or whatever other specific form oil and gold take in the context of the deal. We also might want to consider electricity as suitable value for the experiment as it is measurable, quantifiable by trusted hardware and its’ provenance may be verified by IoT-based protocol. Any peer including the traders may put forward a claim for offsetting and damages for the specific pair of values. For the purposes of the experiment we would propose damages related to combustion of fossil fuels quantified in tonnes of carbon dioxide equivalent (tCO2e). It would represent the complex of negative impact of the pairs in the experiment to the climate, to health, to biodiversity and landscapes, etc., resulting from the extraction, processing, transportation and combustion of natural gas, coal, oil. As proposed in “Third Party Fund in the Peer-to-Peer Transaction-based Model” anyone is entitled to have a say and claim for offsetting or reimbursement. The claims should be substantiated, which means that they should be supported by contributions. In the peer-to-peer transaction-based model the 3rd party claims are proposed to be equal to the square of the sum of square roots of substantiated individual claims in the form of registration of a specific factor within 0 to 2 supported by contributions. The funds collected as contributions would be the source for funding of impact assessment (IA) and development and maintenance of monitoring, reporting and verification (MRV) system, and for reimbursement. The resulting factor is variable and is used for all the transactions with specific pair of values. 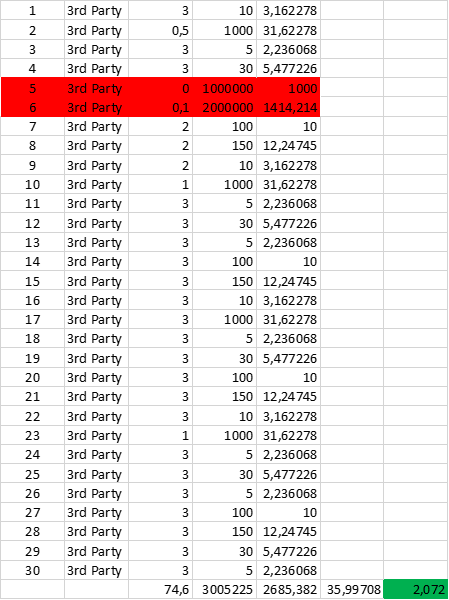 The funds collected (3,005,225.00 in the illustration above) are locked at the funds address and can be moved only through the stakeholders’ consensus protocol or through a distribution protocol (see below). Once the transaction is negotiated, agreed and performed, the contributions are leveraged by payments of the traders (buyer and seller), used to pay for the offsetting instruments and the remainder disbursed as award of damages (see below, The settlement). 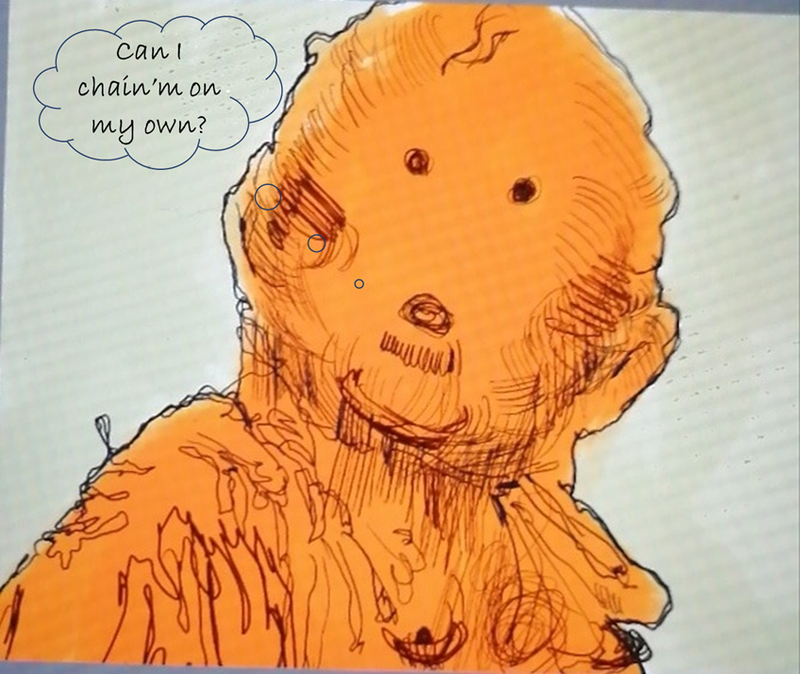 We could run an experiment based purely on substantiated claims for damages in relation to a specific transaction based on Blockchainization of Claims for Environmental Damages and described herein. However, at the end of the day we probably would want to have a quantitative impact assessment at least to get the number of offsets, of mitigation instruments needed. Impact Assessment (IA) is a quantification of the negative impact via specific algorithms and methodologies proposed by the experts. In the context of the experiment we are measuring the negative impact for all the pairs in terms of CO2-equivalent not just because of belief in anthropogenic nature of climate change but because carbon dioxide equivalent has become a universal environmental value equivalent in the business custom to measure impact, risks and mitigation. The methodologies for this quantification are relatively developed. And still, until trusted hard and software is in place to broadcast and process the data at least on energy consumption, fuel balances, grid emission factors, extraction, processing, transportation, storage, losses in the grid, not to mention cyanidation and other hazardous and harmful processes involved for the pairs we have chosen, we have to make a choice preferably without a mentor telling us what to do and how to do it. For large transactions Impact Assessment might probably be in absolute figures related to the particular transaction. For smaller transactions quantification factor per unit traded is more applicable. Anyway, we either must take for granted IA provided by the seller, or by “independent” auditors hired by the seller, or by government agencies, or by “reputable” NGOs or select the IA on a competitive basis. Number of options of IAs from corporations, government agencies, “British scientists” etc. is overwhelming. Otherwise, we can create a p2p protocol to select IAs offered by different entities. The algorithm to calculate, to quantify negative impact and the result of the assessment should be transparent in the public p2p network for the “claimants”, contributors to vote with their contributions. There is limited number of available solutions to calculate the negative impact for cryptocurrencies. The two of the solutions are described in Offsetting carbon footprint for “crypto transactions” and at https://digiconomist.net/. There are different emission factors applied in these solutions, and for the illustration let’s assume that there are three solutions proposed for the use in the experiment with emission factors equal to 700, 861 and 400 grams per kilowatt-hour consumed. 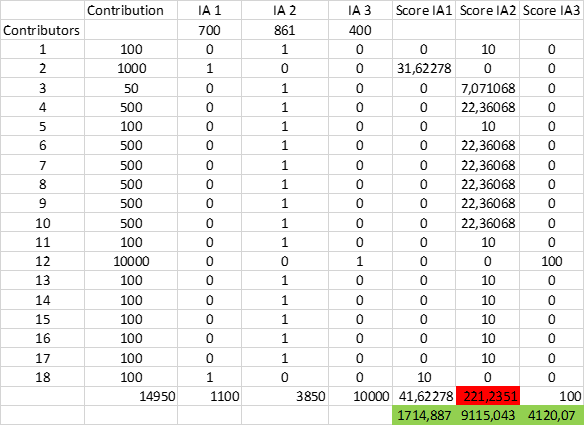 The contributors vote with their contributions for one of the solutions and one them, namely IA 2, wins (final score in red), and all IAs receive certain portion of the total contribution (in green) to continue the development and implementation of IA and MRV systems. The square of the sum of square roots formula is used here too. This step in the protocol, the selection of IA, might be the first one. The offsets represent quantified and verified results of mitigation efforts relevant to the transaction. To offset the negative impact of CO2 emission from fuel combustion removals or absolute reductions of CO2 emissions should be used. To provide for verification, proof of existence and avoid double spending these mitigation instruments should take origin in the same ecosystem the experiment takes place in, i.e. in the public blockchain. The four parties, two traders, offset provider and a 3rd party stakeholders (contributors) then must negotiate and come to an agreement. They would negotiate on the “Factor of Damages” and their contributions would substantiate claims for damages to be reimbursed and offset. The traders would have to with the condition that the transaction can be performed if and only if all the parties come to agreements. They might be interested and motivated to make all reasonable efforts to address the risks of potential liability for the consequences and damages related to their economic activity. Distinction between the seller and the buyer is just to avoid confusion and not mix the traders up, though they both exchange one value for the other. The negotiations are separate and bilateral. 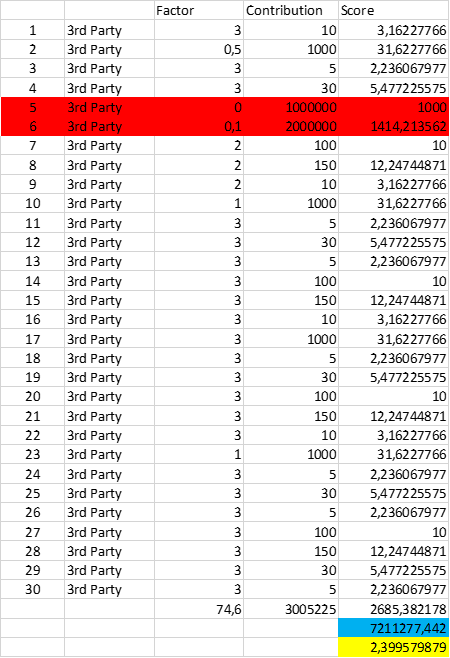 All the parties except for the 3rd party stand for the factor = 1, while the 3rd party stands for the factor = 2,072. As a result, factors reflecting commitments to pay (in red) or receive payment (in green) in correlation with the number of claims to cover the damages. 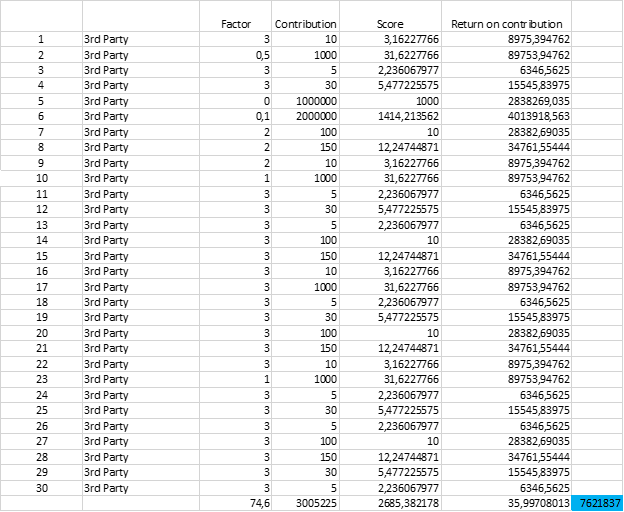 The third-party contributions already have given us the total score points for claims, which came to 7,211,277.442 with the ratio of claims to contributions equal to 2.399579879. The offset provider gets the largest part for the offsets, which would have to be retired (burnt) to mitigate negative impact. The total sum of the return on contributions (in blue) equals the sum of initial contributions (3,005,225.00) plus the proceeds after the settlement (4,616,762.00). Once we get good results from IAs, we can structure the same model basing on quantified negative impact. Or those results may be used to adjust and justify the number of mitigation instruments offset provider must supply. The illustrations with energy intensive values, with CO2-equivalent are presumptive. The approach is applicable to any indirect damages, should it be deforestation as a result of the demand for palm oil, testing Botulinum toxin products on animals for the sake of the beauty industry, child labor, migration as a result of industrial development or climate change, et cetera et cetera. This is not a prediction model. We know how economic and financial predictions work. The illustrations are speculative and illustrative and not based on any empirical data as there is no such data. We cannot predict the behavior of the participants or predict and preclude the attempts to manipulate with the algorithms. We cannot be sure that there would traders ready to lock their values until the settlement is reached. But isn’t it worth trying to get free of mentorship, guidance and extortion of donations and taxes from us by the establishment? What do we have to lose?